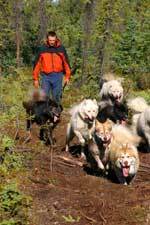 "[Handling huskies] is a specialist area that makes huge demands on people, dogs, critical gear and skills alike. The fact he [Gary] travels alone is testimony to his ability combined with the magical bond between him and his huskies." "Every manufacturer is out there to tell the world they are developing the best products. The fact is, few are, despite their hype. Products I choose to use face deeply challenging circumstances over long periods of time. My gear leads a tough existence keeping the dogs and I safe. Ultimately everything blends, enabling us to operate at the best of our ability. "Here are companies I consider first choice specialists, recommend and consider the best available, worldwide." "Running 1,400 miles in four winter months of polar dark, mostly at minus forty below zero, clothing protects me like fur does for my dogs. Through an entire Arctic year we experience a temperature range of 81°C (30°C above to minus 51°C). I consider my footwear special too. "I'm on my feet training for long periods of time for journeys where my fitness is paramount. I've survived near death situations because of my fitness. It's saved my life. I don't like injuries that prevent me from training. I haven't had a running injury for years since using Sorbothane innersoles. Don't expect any training shoe to give you injury free training. Buy what running shoe you want, they all come with innersoles fit for the bin. "My Sorbothane innersoles absorb foot impact shock from all my activities whether I'm walking in London, training in the park or hammering over frozen sea ice. Sorbothane innersoles help insulate to keep feet warm too, even in brutal cold. "You might not want to train through an Arctic winter but we all want to be injury free to gain healthy well-being benefits from whatever activities we choose." "Intuition Liners offer the world's most extensive line of warm, comfortable, high performance boot liners. I favour three models; the Pro-Tour, the Universal and the Mukluk. The Pro-Tour is a tall lace-up liner. The tongues are removable with soft or stiff options. The Universal is a shorter wrap-around design meaning there is no need for adjustment. When I am training lead dogs or puppies I sometimes wear mukluks made from moose hide or seal skin and inside of these go Mukluk liners from Intuition. Intuition Liners are the warmest and most comfortable footwear liners I have used in all my years living in the Arctic. All the Intuition models I wear are warm, comfortable, featherweight but strong and combine stability with support, in what otherwise has always been a very difficult area to keep happy and healthy in Arctic cold." "Clamcleat guy rope adjusters are one of those attentions to detail that help make Arctic life run smoothly. Setting up camp alone in horrid winds at forty below zero warrants survival mode. Simple to use with big mittens on Clamcleat guy rope adjusters enable me to secure my tent to anchor points, fast. Arctic storms can keep me tent bound for days. Guy ropes fitted with Clamcleats don’t buckle or budge." Content not to be reproduced without permission. To request syndication or reprint rights, contact Gary.